Interpreter certification is only available tor groups of interpreters who have completed Panoltia interpreter training. Individual examination and certification is not offered. Contact us for details. With the increase in the number of people providing interpretation services, it's more important than ever to be able to distinguish between the bilingual person who casually interprets on occasion and the person who is formally trained and skilled in the language, techniques and ethics of interpretation. That's exactly what certification does! 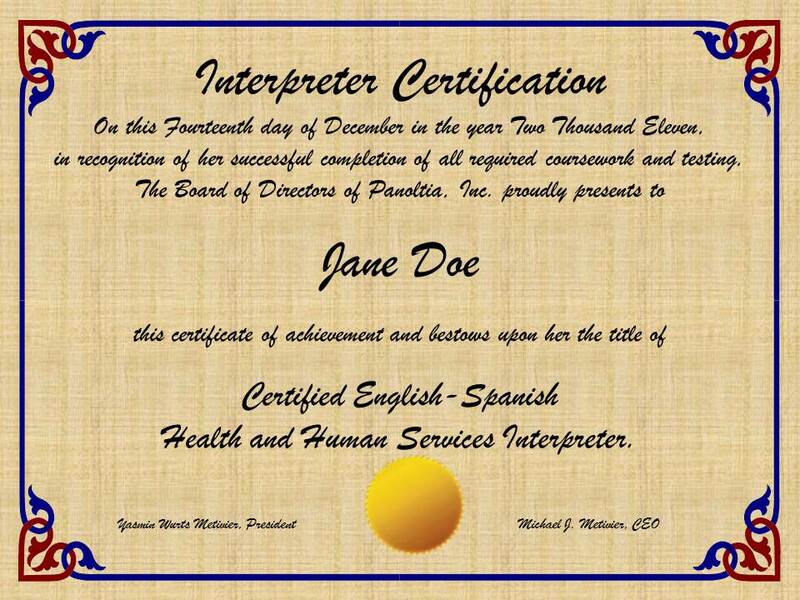 Panoltia has developed a comprehensive English/Spanish interpreter certification program designed to ensure that interpreters are competent and capable of performing effective and ethical interpretation services. What Certifications Does Panoltia Offer? What Does The Certification Exam Cover? What If You Don't Pass The Exam? Yes. After you are certified in one discipline you only have to pass a vocabulary exam in the other discipline to be certified in that discipline. It is not necessary to take additional training; however some candidates prefer to take the training just to sharpen their skills before they take the exam. Certification candidates must take at least one of our training seminars before they will be allowed to take the exam. The seminars are designed to teach candidates everything they need to know to become certified. We'll provide all of the information and materials they need to pass the exam. The only thing candidates need to add is hard work! 1. “Certification” means the interpreter has met minimum requirements and has scored at least 70% correct on each section of the certification exam. 2. 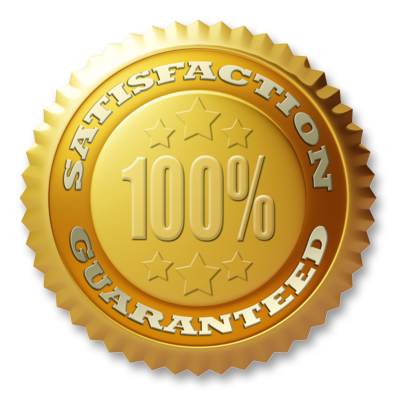 “Advanced Certification” means the interpreter has far exceeded minimum requirements and has scored at least 90% correct on each section of the exam. The interpreter certification exam consists of two parts, a written exam and an oral exam. Each part is comprised of multiple sections. Section 1 - Technical Language – The first part of the exam tests the candidate's knowledge of the vocabulary and terminology necessary to interpret in their specific discipline. Section 2 - Generic Language - To function as a skilled interpreter, basic language proficiency is required. This section tests the degree of general literacy in both English and Spanish, including comprehension and fundamental language skills. Section 3 - Interpreting Fundamentals - Interpreting requires more than language fluency - much more. This section tests the candidate's knowledge of the concepts, skills, techniques, and terminology required to function as a professional interpreter. Section 4 - Ethics and Professional Conduct - The fourth area of knowledge addressed by the written test is knowledge of ethics and standards of professional conduct. Section 5 - Cultural Competency - In this section candidates are tested on their knowledge of Latino immigrant culture. Each question will have one correct answer. A score of at least 70% correct on each section of the written exam is required to pass. To qualify for “Advanced Certification” the candidate must score at least 90% correct on each section. Note: The candidate must pass the written exam before he or she qualifies to take the oral exam. the ability to speak both Spanish and English clearly and in a way that does not systematically interfere with meaning and understanding. Spanish to English – This part of the exam simulates an interpreter reading a Spanish language document aloud in English to an English-speaking person. The document is approximately 200 words in length. English to Spanish – This part of the exam simulates an interpreter reading an English language document aloud in Spanish to a Spanish-speaking person. The document is approximately 200 words in length. During this portion of the exam, the interpreter interprets English language questions, comments, statements, conversation, etc. (segments) into Spanish, and the Spanish responses into English. The examinee may ask to stop the dialog up to four times to ask for repetition, clarification, definitions, etc. The interpreted bilinguaal conversations can be either recorded or read live by the examiners. During this portion of the exam, the candidate listens to each monologue and, while listening, interprets aloud from the source language into the target language. This part of the examination takes approximately ten minutes, including instructions and preparation. * The simultaneous interpreting portion of the exam is optional. Candidates who choose not to take it or choose to take it and fail can still be certified if they pass all other parts of the exam. Their certification documents will indicate that they are only certified to interpret consecutively. subjectively, by an overall subjective evaluation. Scoring units are particular words and phrases that are selected to represent various features of language that interpreters encounter in their work, and that they must render accurately and completely, without altering the meaning or style of speech. General vocabulary - a range of nouns, verbs, adjectives, etc. Slang/Colloquialisms - words or phrases that are slang or colloquial language. How many scoring units must a candidate get right to pass the exam? In addition to the evaluation of a candidate’s scoring unit assessment, each section of the exam is further evaluated by the examiner for consistency in interpreting and language skills. This is a subjective, structured assessment of interpreting and language skills that may not be captured within the framework of the scoring unit assessment. It is used to evaluate any consistently repeated mistakes, difficulty understanding a candidate due to speech habits or accent, and significant changes in meaning in non-scoring unit phrases of the exam. For example, on rare occasions a candidate might “hit” the correct interpretation of scoring units enough times to achieve the minimum acceptable score in an exam section, while routinely misinterpreting the entire unit of meaning within which the scoring unit has occurred. Candidates might also manage to correctly interpret many keywords, but frequently embellish the text or “make-up” words. These are serious breaches of professional conduct and may result in an unacceptable rating on that dimension of the evaluation. The subjective evaluation functions as a corrective measure of the quantitative performance criteria associated with the point score earned through interpretation of the scoring units. Using this evaluation, the examiners will assign one of three values to the candidate’s performance on each of three dimensions: English Language Skills, Spanish Language Skills and Interpreting Skills. The values are Acceptable, Borderline, and Unacceptable. Assignment of an Acceptable score occurs when the examiners believe that the candidate’s overall performance is competent or better. In such circumstances the scoring unit scoring will determine whether the candidate passes or fails the exam. A Borderline classification is an indication to the candidate that his/her performance on the exam demonstrated weaknesses that concerned the examiner. This rating does not affect the objective (scoring unit) score, so a candidate will not fail the exam if a borderline rating is received and the candidate passes on the point score. Examiners will assign an Unacceptable rating when a candidate's performance clearly does not meet minimum standards for interpreting. Usually, Unacceptable ratings are matched by scoring unit scores that do not meet the minimum standards for passing the exam. However, if an Unacceptable rating is given on any of the three dimensions of the subjective scoring system, the candidate will receive a failing grade for the exam, even if the objective (scoring unit) score is in the passing range. Candidates will be notified by e-mail of their exam results within 10 business days of completing their exam. A candidate who doesn’t pass the examination on the first attempt will be provided general feedback on the area(s) of the exam that they failed, and will be allowed to retake the exam once within six months of the original exam date at no additional charge. If the candidate fails only one section of the exam he or she will only be required to retake and pass that section to be certified. If the candidate failed more than one section he or she must retake and pass the entire exam to be certified. Note: It is important to note that the exam you take for your second attempt at either the written or oral exam will not be the same exam you took for your first attempt. The second exam will cover the same material as the fist exam, but it will contain different questions, dialogs, etc. Security of the exam materials is critical for obvious reasons. All Panoltia materials are protected by U.S. and international copyright laws. Candidates may not copy, record, duplicate, transcribe, or in any other way capture or otherwise represent the content of any portion of the exam. VIOLATORS WILL BE PROSECUTED. If the examiner suspects that an examinee is cheating in any way, including receiving assistance during the exam, communicating with others, copying or otherwise compromising the security of any portion of the exam as described above, or using prohibited aids, the instructor will immediately terminate the examination and the examinee will be permanently disqualified from certification. You must be prepared to begin your examination at your agreed upon date and time. If you are more than 15 minutes late you will forfeit your place on the exam schedule and you will receive a failing grade on your exam. You will have one more opportunity within six months of your original exam date to take the exam. Candidates are allowed to use reference materials during the exam. One important note - the exam is timed so a candidate who is overly reliant on reference materials will run out of time before they complete the exam. The candidate should have an excellent grasp of the exam content so they don't have to rely on reference materials. Question: Exactly what does it mean to be certified? Answer: It means that an individual has passed an examination designed to determine whether they meet the requirements to function as an interpreter in a given field. Question: Why is certification important? Answer: It depends. If you're an interpreter, certification from a respected interpreter trainer instantly opens doors for you! Few interpreters are certified, and if you are, it sets you apart and tells a potential employer or client they don't have to guess when they hire you. They know you have the skills and knowledge to do the job, and they can hire you with confidence. And if you're an employer, certification tells you your in-house interpreter or potential employee has the language skills, the techniques, the culture knowledge and the ethics to do the job. Question: Is if difficult to pass the certification exam? Answer: It isn't difficult if you are willing to work hard and practice. People who expect to pass the certification exam simply because they are bilingual and attended an interpreter seminar will almost certainly be disappointed. Question: How will I know how to prepare for the exam? Answer: We'll tell you. Our seminars give you all of the information you need to pass the exam. If you work hard and use the resources we provide you should be able to pass. Question: Where do I have to go to take the exam? Answer: The certification exam is taken online, so you can take it at home, at work, or anyplace where it's quiet and you have access to a computer with a webcam, microphone, headphones, and high speed internet access. Question: When will I know if I passed? Answer: You should expect to receive your exam score within 10 business days of taking the exam. Question: What if I disagree with the grade I receive? Answer: You can appeal. The content of the exam is very specific, and your entire exam will be recorded, so if you believe it wasn't graded accurately it will be possible to go back over it with a certified examiner and discuss in detail how it was graded. Question: Can I be certified in more than one discipline? Answer: Yes. All you have to do is take the exam for the additional certification. If you pass you will be certified in that discipline. Question: If I get certified does it mean I can interpret in court? Answer: Probably not. Court certification in most jurisdictions is very specific, and unless you are court certified in your jurisdiction chances are you are not considered qualified by your court system. At this time Panoltia does not offer court certification. If you wish to be a certified court interpreter you should contact the Administrative Office of the Courts in your state. Contact Panoltia for more information or to schedule your group's exams. Interpreter E-News is our interpreter newsletter, and it's packed with discounts, great articles, tips from the pros, and much more. And best of all, it's free! We'll never share your personal information with anyone and you can unsubscribe at any time. Sign up now. Copyright © 2000 - 2017 Panoltia Inc., All Rights Reserved.